If your “ProgramData” folder is not part of your regular backup routine then you will be exposing yourself to data loss if, among other actions, you re-install your operating system, change PCs or have the misfortune of data corruption. 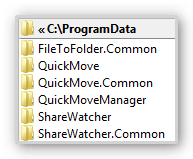 ProgramData is the standard, hidden Windows Folder where “All Users” data is saved by many applications. CodeLine saves its application data here too and strongly suggests backing up these locations.